An Orlando parent said she was appalled when her 9-year-old daughter brought home her report card cover and it contained an advertisement for McDonald's promising free Happy Meals for good grades, attendance and behavior. Her complaint prompted the Boston-based child advocacy group, Campaign for a Commercial-Free Childhood to demand Wednesday that McDonald's immediately stop the report card advertising in the Seminole County School District. "The promotion takes in-school marketing to a new low," said Susan Linn, the co-founder and director of the campaign, who said she had not contacted the restaurant chain or the school district. The group issued its demands in a news release. "Children's lives are just saturated with advertising and marketing. Schools should be commercial free space," Linn said. "It bypasses parents and targets children directly with the message that doing well in school should be rewarded with a Happy Meal." Regina Klaers, a spokeswoman for the district, said school officials are not aware of the group's demands and only had a complaint from one parent. "We haven't seen the press release. We can't respond to it," Klaers said. She defended the practice, saying advertisers have sponsored the report card jackets for more than a decade because it saves the district money. 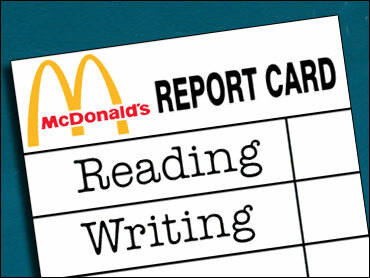 McDonald's paid $1,600 to print 27,000 jackets for elementary school report cards. Before that, Pizza Hut printed the covers for the past 10 years, she said. The School Board will revisit the issue in the spring when it considers who will sponsor next year's covers, she said. The issue came to light last week when Susan Pagan's daughter, Cathy, a fourth-grader at Red Bug Elementary School, brought home her report card and wanted to get a free Happy Meal because she earned good grades. Pagan told her daughter, "Our family does not eat at fast food chains," Pagan said. "And, now I'm the bad guy." Pagan said she complained to school officials in an e-mail about the advertising and received a telephone call from Superintendent Bill Vogel. She said he told her that she was the only person who complained and he noted that McDonald's offers some healthy alternatives. With the emphasis on healthier eating and problems with childhood obesity, she said she thought the advertising was inappropriate. She contacted Linn's group in Boston. "I'm outraged that McDonald's is trying to exploit my daughter's achievement - and that the Seminole County School Board would help facilitate this exploitation." Pagan said she is not opposed to fast food, but she said there are professional and appropriate ways in addressing sponsorship and "not directly bombarding our children with this marketing." In a statement, William Whitman, a McDonald's USA spokesman, said, "This is a local program in Seminole County, Florida, that promotes academic excellence and rewards academic achievement. It is supported by the School Board of Seminole County and widely supported by the local community." "McDonald's does not advertise in schools. However, we continue to support education initiatives in the communities we serve," the statement said. He noted the Happy Meal choices include Chicken McNuggets made with white meat, hamburgers, cheeseburgers, apple dippers, apple juice and low-fat milk. Campaign For A Commercial-Free Childhood is a national coalition of health care professionals, educators, advocacy groups and concerned parents who are trying to counter what they claim is the harmful effects of marketing to children.